All we know instant sms feature is very useful for us. 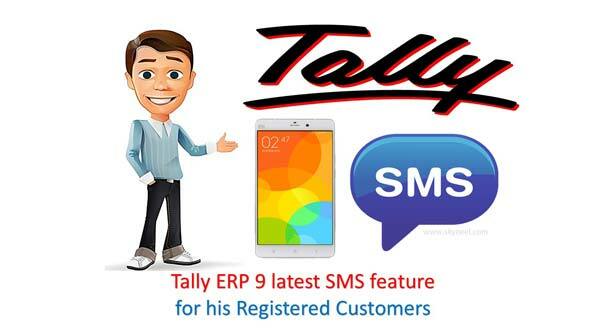 Tally ERP 9 latest sms feature is available for his registered customers. With the help of SMS feature you can easily get latest business related information with the help of SMS. SMS is one of the most popular way to communicate with other peoples. As per watching the importance of SMS feature Tally ERP 9 also introducing latest SMS feature for his registered customers. During travelling, dealing with the parties or any other situation you can easily get business related accurate information on your registered mobile number. Most of the person want to know that Tally ERP 9 SMS feature is paid or free service? The answer of this query is Tally ERP 9 SMS feature is Free part of Tally.NET Services which is provided by Tally Solutions Pvt Ltd. But it may be possible that your mobile service provider can take charge of SMS Services. You have to contact with customer care number of your mobile service provider for further details regarding charges. Tally ERP 9 latest SMS feature allows you to provide instant business related information at your fingertips. You just press few keys and send SMS now you will get instant message of your business related query. You can get quick stock status, customer outstanding balance, bank balance etc information at any palace. If you want to get the benefit of Tally ERP 9 latest SMS feature then you have to complete given four steps, have a look. 1. Register mobile number for activate SMS feature. To register your mobile number you have to take few given steps, have a look. Step 1: GOT > Press Ctrl+K to open the Control Panel. Step 2: Fill the user’s email id and password and press enter key. In Control Centre window you have to press W key to directly open My Profile box. Now you have to fill all required information in the box eg: Salutation (Mr, Mrs), Contact person name and Mobile numbers. After finish the first step you have to enable SMS feature at your registered number. To do this job you have to follow few given steps. Step 2. By default Enable SMS Access set to No. Set Enable SMS Access to Yes and enter the nick name of the company. To authorise the users with Tally.ERP 9 you have to take given simple steps. Step 1: GOT (Gateway of Tally) > Press F3 to open Company Info window > Choose Security Controls > Now, choose Users & Passwords option. Step 2: Set the following information in the List of users for company window. After successfully done all the previous three steps now you will come at final step to connect company with Tally.NET. To do this job you have to take following given steps, have a look. Step 1: Open the Gateway of Tally (GOT) > Press F4 to Connect the Company. 9 is the SMS Suffix or unique number which is assigned to the company connected to Tally.NET. The SMS Suffix available between 1 to 9 numbers. For eg 1: If you want to know the current cash balance position of active company then you have to type “Cash Balance as on 15/04/2017” and sent it to 5667791.
eg 2: If you want to know outstanding balance of any specific customer then type the following sms “What is the outstanding from Customer Amit?” and send it to 566779. I hope after reading this article you can take benefit of Tally ERP 9 latest SMS feature. If you have any suggestion or query regarding this guide then please let me know via comment box. Thanks to all.